Teenager Anthony Martial should be Manchester United's outright striker this season instead of Wayne Rooney, says Ruud van Nistelrooy. The 19-year-old Frenchman, who arrived from Monaco for £36m, scored on his debut against Liverpool last weekend. "He looks like the out-and-out striker that is needed," said Van Nistelrooy. 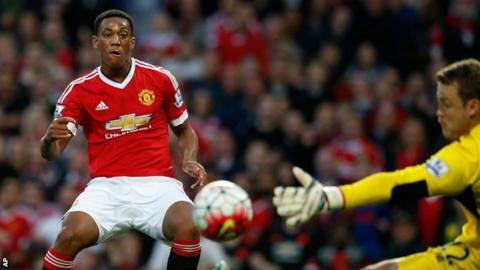 "It would be a good combination if Martial was up front and Rooney was just off him. That would be a good strike force." Martial started up front for United in their Champions League tie at PSV Eindhoven on Tuesday, with Rooney ruled out because of a hamstring injury. But, despite an encouraging individual display, he was unable to prevent Louis van Gaal's side slipping to a 2-1 defeat. Manchester United manager Van Gaal said in the summer that Rooney, who played in midfield for periods of last season, would be his main striker. "Wayne Rooney is playing in that position but I don't think he is an out-and-out striker," added 39-year-old Van Nistelrooy, who scored 150 goals in 219 games for the Red Devils between 2001 and 2006. "But obviously he can fulfil that role and score his goals."